If you have ever been to a ceilidh then you will almost certianly have danced several simple Scottish country dances. These are the dances danced in 'sets' - whether 'square sets' where you stand next to your partner forming one side of a square or 'long-wise' sets where you stand opposite you partner in a line of similarly positioned couples. There are two tempos in Scottish country dancing. There are fast reels (2/4 or 4/4 time), jigs (6/8 time) and hornpipes (2/4 or 4/4 time), such as those danced at ceilidhs; and there are slow, elegant Strathspeys (2/4 or 4/4 time) - a dance form unique to Scotland. 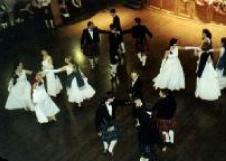 Some dances are medleys - part of the dance is in Strathspey time and part(s) in reel and/or jig time. tune will usually be played during the first and eighth times through the dance. All Scottish country dancing is danced in sets. These may be 'long-wise' sets where you stand opposite your partner, and the man has his left shoulder towards the top of the set (= band/music) so that there is a line of men and a line of women.Longwise sets are frequently made up of 4 couples but may contain 3, 5 or 7 couples. of the set and the dance description will explain how they should start the dance. two couples or 3 people. Each Scottish country dance is made up of a sequence of formations (for example 'circle round and back', 'advance and retire', 'turn corner, partner, corner, partner' or 'pousette' - some are obviously more self-explanatory than others!). the dance (once through) is determined by the number of formations contained in it. To be danced once through, the majority of dances require 32 bars (although 40 bar dances are not uncommon) and most dances are repeated until every couple has had one or two turns of being 'top' or 'dancing' couple - 4 or 8 times, for example, in a 4 couple set. couple usually does an equal amount of dancing. Such dances may be made up of a number of 'sections' - for example a 'beginning and end section' on either side of a 'middle section' or a 'chorus' which is repeated interspersed with 'verses'. Some, however, have no such 'logic' and remembering a sequence of formations lasting 96 bars or more can be a severe memory test! actually knows all the dances - there are after all an estimated 9,000 of them! people know) but do not worry if this takes time. Wolverhampton Caledonian Society country dance class takes just this approach. even if you've never done dancing of any type before. early September to mid May as the Events entry.